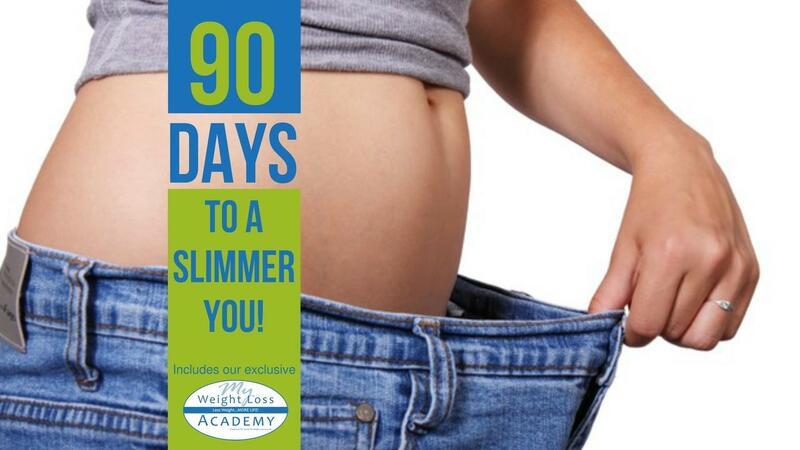 90 Days to a Slimmer You! The 90 Day Simplified Weight Loss Program to a Slimmer You! This 90 day program includes the popular My Weight Loss Academy™ online program along with 6 one-on-one accountability coaching sessions for optimal success and a 6 month membership to our fitness facility. Everything you need as well as the MANY bonuses listed below. You can finally experience long-term successful weight loss, feel better, have more energy, live an active life and focus on what you “can” do rather than what you “can’t” do. You will realize you have been making weight loss more complicated (and less fun) than it has to be. My Weight Loss Academy™ digital program. - Includes immediate access to 14 modules of training (written material, videos & PDF action guides) conveniently available via your online membership site (access to all materials available for 6 months and downloadable for continued use). You can move at your own pace or follow the step-by-step program instructions you will receive each week/month via e-mail for accountability and easy to follow guidance. BONUS 21 Day Challenge Your Weight Loss Plan for a Lifetime of Success - Change Your Habits...Change Your Life—one day at a time. This easy to follow, day by day guide shows you how. Accept the challenge and feel the difference! BONUS 6 month Losing Weight USA membership. - Puts you on the fast track to quicker results and provides direct access to one of the most experienced bariatric surgeons and bariatricians in the United States! Dr. Clark’s interactive weekly live webinars cover topics filled with information on how to increase your weight loss efforts. Be ready with your questions...he has answers! Each week also brings you new tip sheets, recipes and fitness ideas. Visit www.LosingWeightUSA.com for full details. BONUS Weekly Lifestyle & Behavior Modification “How To” Classes - Learn not only what to do, but more importantly ‘how to do it’ with these proven strategies. BONUS Recipes, Meal Planning & Journaling Templates (PDF), Online Healthy Recipe Book (PDF) and Carbohydrate Counter Tool (PDF) Remove the mystery of counting carbs! After you purchase your program online, you will receive an email containing your username and password for the Membership Site. Log on and become familiar with the various tools you have to use. You will receive a phone call (M-Th 8:30-5) from our office to schedule your initial counseling visit and equipment orientation. Your more comprehensive weight loss experience. This program includes the education component of My Weight Loss Academy™ and adds accountability with 6 individualized counseling sessions (either on-site or via phone) as well as membership to our state-of-the-art fitness facility! A $506 value for just $299!